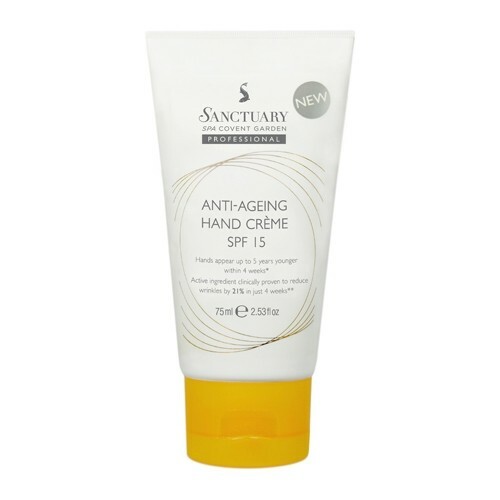 This rich anti-ageing creme contains actives to help the skin's structure from within, while on the surface, it leaves skin feeling firmer and appears more radiant, for hands that look and feel younger. Massage into clean dry hands, paying special attention to your cuticles and nails. For a more intense treatment use the Ultra-Refing Hand Polish before. African Tiger Nut Shown to help restore collagen to plump out fine lines and wrinkles, reducing the number of wrinkles by over 20% in just 4 weeks. Asafetida A spice-resin proven in tests to help lighten age spots and even skin tone. Pumpkin Shown to improve cell renewal to reveal brighter, younger looking skin. SPF15 Protects exposed hands from sun damage. 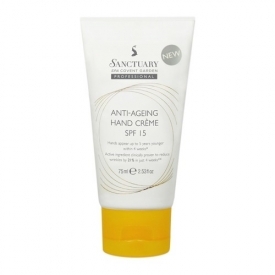 Full Ingredients List: Aqua (water), Ethylhexyl methoxycinnamate, Dimethicone, C12-15 alkyl benzoate, Glycerin, Cetearyl alcohol, Octocrylene, Butyl methoxydibenzoylmethane, Magnesium aluminum silicate, Caprylic/capric triglyceride, Polyacrylamide, Butylene glycol, Ethoxydiglycol, Phenoxyethanol, Petrolatum, Panthenol, Inulin lauryl carbamate, C13-14 isoparaffin, Aluminum starch octenylsuccinate, Limonene, Citrus nobilis (mandarin orange) peel oil, Disodium EDTA, Ferula foetida root extract, Caprylyl glycol, Cyperus esculentus tuber extract, Lactobacillus/pumpkin ferment extract, Chlorphenesin, Xanthan gum, Sucrose palmitate, Laureth-7, Phytantriol, Citrus grandis (grapefruit) peel oil, Citral, Sodium hydroxide, Cymbopogon flexuosus oil, BHT, Ethylhexylglycerin, Geraniol, Linalool, EDTA. Far too expensive for the results but still a nice product. Smooth and easy to use. It absorbs very easily and feels nice on the skin but in all honesty there are other products as good and that cost a lot less.